Rated A for some sexual content, abusive language, authentic lingo and violence. Towards the end of colonial India, Sahid Khan loots the British trains, impersonating the legendary Sultana Daku. Now outcast, Shahid becomes a worker at Ramadhir Singh's colliery, only to spur a revenge battle that passes on to generations. 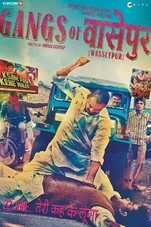 At the turn of the decade, Shahid's son, the philandering Sardar Khan vows to get his father's honor back, becoming the most feared man of Wasseypur. Staying true to its real life influences, the film explores this revenge saga through the socio-political dynamic in erstwhile Bihar (North India), in the coal and scrap trade mafia of Wasseypur, through the imprudence of a place obsessed with mainstream 'Bollywood' cinema. Bolstered by its riveting performances and its thrilling plot dynamics, this is a gripping film that seizes your full attention. Despite its occasionally indulgent narrative, this bullet-ridden saga is worthy of a repeat viewing, if only to catch all its nuances. Don’t miss it. GANGS OF WASSEYPUR symbolizes the fearless new Indian cinema that shatters the clichés and conventional formulas, something which Anurag Kashyap has come to be acknowledged for. It has all the trappings of an entertainer, but with a difference. The film prides itself with substance that connects with enthusiasts of new-age cinema. But, I wish to restate, one needs to have a really strong belly to soak up to a film like GANGS OF WASSEYPUR. Also, this striking movie-watching experience comes with a colossal length and duration. The reactions, therefore, would be in extremes. GANGS OF WASSEYPUR is for that segment of spectators who seek pleasure in watching forceful, hard-hitting and gritty movies. Anurag Kashyap gets flavour, setting and character right with Gangs Of Wasseypur but the lack of economy cripples the film. Yet it is the excess that suffocates all the magic, originality dying out for lack of room to breathe. There is a lot of gunfire, but like the fine actors populating its sets, Wasseypur fires too many blanks.